Apostolic leader founder of Kingdom Faith and well known author of many best sellers, Colin Urquhart has been ordained for over 50 years. His apostolic ministry is widely recognised and valued throughout the world having both experienced and led others in revival. Author of over 40 books, Colin has recently released a new translation of the new testament, entitled "The Truth" the result of over 2 years work. Subsequent to this a Study Edition has been released with over 300 more pages than the Standard version. Earlier this year Colin Urquhart released "Major Themes from The Truth Verson", a brand new book that contains key verses from both Old and New Testaments of 150 major themes giving the reader a comprehensive biblical insight to subjects such as salvation, judgement, heaven, mercy, grace and love. At over 680 pages this is a substantial book of biblical truth. Colin is an established international conference speaker as well as the principal of Kingdom Faith Training College where he brings his apostolic vision and anointing to students from around the world. God has commissioned him to train men and women to carry the presence of Jesus Christ, His Spirit, His power and glory wherever they are led to serve Him. He also makes regular appearances on Christian television and radio programmes. › You can access over 500 Faith For Today radio messages from Colin Urquhart on kingdomfaith.com. 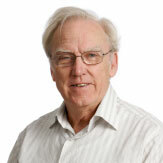 › To purchase any of Colin Urquhart's books, visit the Resource Centre online by clicking here.